It all started about 5 years ago, with a few buddies from work getting friends together to grab some beers on the weekend. We thought it would be fun to visit many bars in one night. And after 300 events with thousands of new pub crawling friends joining, and we're still going strong! Many people come didn't know anyone, so don't be shy. 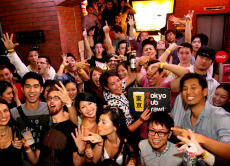 Our members include Japanese, non-Japanese, guys, gals, and people from every corner of the earth. We welcome everyone! Tokyo is a huge city with tons of people, yet many people feel somehow isolated. 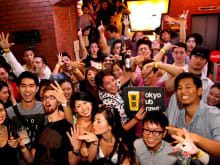 When we do the Tokyo Pub Crawl, people come together, and this is why we keep doing it. Part of the fun is that we keep moving and changing the scenery. It makes the evening feel more like an adventure. Another reason is everyone who comes has the same expectation: to have fun and be social. It's a good combination. Great night especially because it was Halloween. Met a lot of people. So many drinks you will def get enough drinks. Didn't received the info on where to meet. Couldn't attend the pub crawl. Very Disappointing.